So let’s talk about Chosen One narratives. Characters who are destined to do incredible things and whose fates are written in the stars. A lot of times this trope can be a lazy shortcut to justify why a character has to be involved in a conflict; the writer doesn’t have to properly motivate them to fight the good fight, they just Have To. I don’t generally mind it as much as some critics do, but I can see where the argument comes from. But I also think books like Witi Ihimaera’s 1987 novel The Whale Rider show that it can be done well. 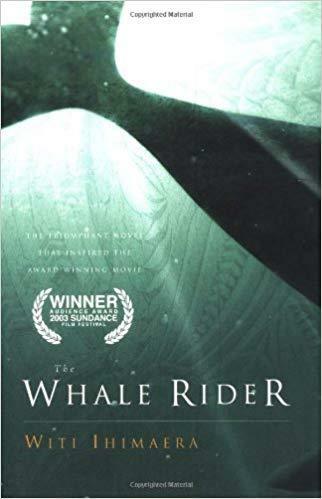 The Whale Rider tells the story of Kahu, a young girl who is the eldest great-grandchild of her Maori tribe’s chieftain, Koro Apirana, and if she had been born a boy, she would have been considered destined to be the tribal leader of her generation. The story is told by her uncle Rawiri, a young man seeing the Maori way of life change around him and his niece fight for the love of the great-grandfather that she adores. Kahu seems attuned from birth towards the traditional Maori ways of life, and may have inherited the ability from her namesake ancestor to speak to whales. I saw the 2002 movie adaptation as a teenager and remember really enjoying it, though I can now see that the film shifted the perspective to make it more from Kahu’s point of view, whereas Rawiri feels like the more fleshed out and real character in the novel. He lives away from Kahu for years at a time and comments on how life differs in the big cities of Australia and Papua New Guinea from the small New Zealand village that he grew up in. Kahu seems so absolute in her beliefs and convictions that it is Rawiri who feels more human with his doubts and questions. Kahu feels larger than life, and I agree with Ihimaera’s decision to let the narrator marvel at her from the sidelines like the reader rather than position the book through her eyes. It makes the Chosen One trope of her life sit a lot more comfortably, if it does rob Kahu of some detail. I know very little about Maori culture, but Ihimaera weaves it in very smoothly as a natural part of the plot, educating without info-dumping. The parts about Maori culinary culture in particular were really interesting and inspired some trips down the wiki rabbit hole. All in all, I’m really glad I read this one and I will be interested to go back and watch the movie sometime soon. Would I Recommend It: Yes. Previous Come see my 10-min play “The Most Just” at Monday Night PlayGround,Oct 15! Next “The Most Just” announced for the October People’s Choice Award at PlayGround! My name is Alanna McFall and I am a novelist and playwright based out of the Bay Area. Short story writer, member of the Monday Night PlayGround Writer’s Pool and author of the upcoming novel The Traveling Triple-C Incorporeal Circus! Best of PlayGround 23! And the June Anne Baker Prize!